Prince Jacon Igwe discusses the role of a Social Media Librarian in academic libraries, and presents an innovative use of digital billboards to promote the library’s and institution’s work whilst increasing engagement with students, academics and the public. Social media is being increasingly used by academics to demonstrate their “impact” to funders and management. Having the library engage social media users to help spread the word about relevant University research and resources can therefore also be a demonstrable benefit the library is bringing to their academics. Ana Margarida Dias da Silva has provided an article on Folksonomies in Archives. It looks at how archives in France have made use of modern web technologies to bring user input and controlled social collaboration into metadata creation for their large numbers of records. These “folksonomies” aim to change users from passive consumers of archive information to active participants in the creaste and maintenance of archive data sets. Jason Cooper describes how a lightweight temporary library catalogue system was constructed when Loughborough University opened their second campus in London. This version of the catalogue was viewed as a temporary measure for what was effectively a new branch library attached to a previously single site based catalogue. As the University’s main library system was to be replaced within a few years, support for multiple sites would be added at that point and so this option reduced configuration and recataloguing requirements in the meantime. We also have some book reviews: Tanya Butchers reviews, “Library Management in Disruptive Times: Skills and knowledge for an uncertain future” edited by Steve O’Connor, Helen Young reviews, “Dynamic research support for academic libraries” edited by Starr Hoffman, and Adrienne Muir reviews, “Copyright and E-learning: a guide for practitioners”, by Jane Secker with Chris Morrison. 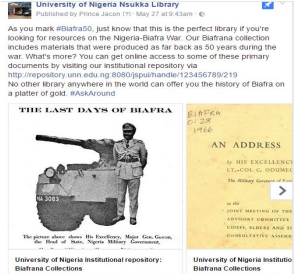 An example of the social media being used to highlight library resources at the University of Nigeria Nsukka Library.